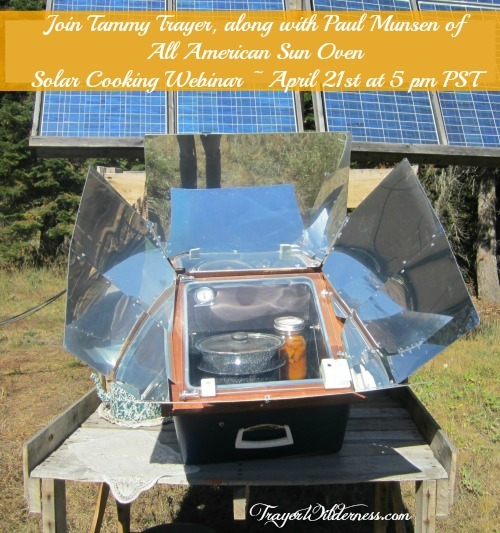 We are really excited to be able to offer you a FREE Solar Cooking Webinar! As most of you know I have been reviewing the All American Sun Oven and have produced many videos, posts and taught at GNOWFGLINS Outdoor Cooking Class this year. The All American Sun Oven is a top quality unit and just absolutely awes me. I built a potting table / outdoor kitchen with repurposed pallets so that I could have a convenient work space because I use it as often as the sun shines! You can find the how-to article in the current issue of the New Pioneer Magazine Issue #193 Spring 2015. Our webinar will be live on April 21st at 5pm PST. Now if that time does not suit you will be able to watch the replay of the presentation, BUT you must register for the event anyway. You will receive an email with the link for the presentation to which you can either view live at 5 pm or watch at your convenience, but keep in mind, the replay will . 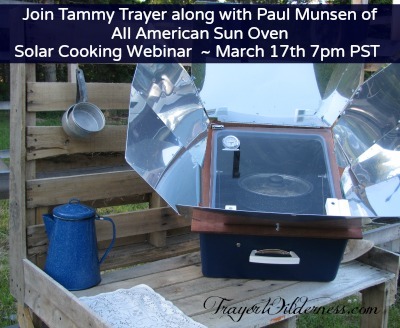 PLEASE don’t miss this opportunity to learn all there is to learn about solar cooking and even be able to ask your own questions during the webinar. If your questions are not answered during the show we will be sure to answer them either on a post on our website or via email. What are some questions you would like to have answered on solar cooking and the All American Sun Oven? Along with summer comes bee bites, allergies, mosquitoes, etc. Additionally, the children are home and often in need of things to do. 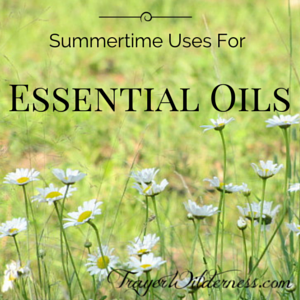 There are many great ways to incorporate essential oils into your summertime fun as well as utilizing them for your summertime necessities. Rather than risk my families well-being by utilizing dangerous chemical ridden alternatives that are on the market, I prefer to make my own bug spray, lotions and even blends of oils to combat the summertime needs. Not only is it nice to be able to quickly replenish the things you use regularly, but to have the added comfort that the products you are using are safe, beneficial to your body and the added bonus is they are also less expensive. What will you find at such an event? You will find other like minded people, an opportunity to ask questions, prizes, recipes and a LOT of essential oil education and recipes! Our hope is that you not only learn some new things, but that you have an enjoyable time as well! PLEASE leave your questions & comments in the comments section below…..
Let me explain how this event will work. On our website: You can return to this exact page (so bookmark it a while) and if you choose to participate here, there will be a handout available to read online or print out and possibly a video that you can watch. Once you have completed reading/watching you can leave your questions or comments on the video/handout below and I will be available to answer your questions and communicate with you. You are also welcome to email me privately. There are also downloads below that will be helpful for you for the event. On Facebook: If you choose to participate on Facebook you can join the event using this link https://www.facebook.com/events/1670849473137776/. You will want to return here to access the handout and you will want to also access the downloads below which will also be helpful for the event. On Facebook, you will experience roughly 10 to 15 different posts which will include text, photos and video clips of the full video that is available here. Everyone has a different form of learning so we are trying to accommodate everyone’s needs. Now if you are unable to attend, the handout will appear on this page the night of the event and will be accessible moving forward so you can return at your convenience and learn at your own pace. The Facebook link will also be accessible to you so you can go there as well to look over what transpired. There is always a lot of communication going on there and others often share wonderful tips and ideas as well. I am always available to answer your questions whether it be in the comments below or in a private email. I look very forward to having you join me! Please let me know if you have any questions or need help with anything. You can email me at oils@trayerwilderness.com. If you missed our other webinars, you can access them by clicking on the WEBINARS link on the menu above. If you might be interested in purchasing any oils prior to the events you can visit our store at http://trayerwilderness.com/oils. I would love to get your feedback in the comments below on your thoughts of the event and if you have requests for other essential oil topics, please be sure to let me know. Our webinar will be live on St. Patrick’s Day, March 17th at 7pm PST. Now if that time does not suit you will be able to watch the presentation until the 21st, BUT you must register for the event anyway. Tuesday morning you will receive an email with the link for the presentation to which you can either view live at 7 pm or watch at your convenience until the 21st. Our 1st essential oil webinar was a great success. Below you will find the link for the recorded webinar so that you can now watch it from the comforts of your home at your convenience. Please read this whole email prior to watching the video, if you would please. Please enjoy and when you are finished I would love for you to email me with your questions, what you might like to learn in my upcoming webinars and how I can be of more assistance to you. For those of you that were interested in essential oil basics and education in general, please stay tuned for more upcoming webinars, YouTube videos and educational Google+ Hangouts I will be doing a lot as we progress through this series and I look forward to showing you my herbal pantry and sharing all my recipes, medicinal survival kit in my pack and knowledge with you. For those of you that were interested in learning more in relation to autism, aspergers and ADHD, etc. you can also stay tuned for more specific webinars, YouTube videos, educational Google+ Hangouts where my son will join me and we will go over the varying things we did that helped him go from being almost completely non-verbal at age 7 to a 17 1/2 year old self reliant young man who just got his learner’s permit to drive in Idaho. He has a lot to share personally and I would LOVE to educate you on our whole foods and gluten free and casein free diet, supplements, herbs, schooling, exercise and how it all has helped him greatly excel and overcome 97% of his autism and asperger tendencies. One of my greatest struggles as a Mom of a special needs child, has been people telling me they have found great things to help their child, but never referred me to the product or how to get it. I just want you to understand that my passion has been for healing my son and because of the knowledge I have – I focus very heavily on sharing that knowledge with others so their children too can live a very full and self reliant lifestyle. I am so very proud of my son and without all my angels that God had cross my path sharing such valuable information, my desire to help heal him and my determination not to medicate him he would not be where he is today. So this webinar was meant as a way for me to open a new door and begin to share my knowledge in an effort to help. Be sure to continue on this journey with me as I share my knowledge and passions with you. I encourage you to email me at oils@trayerwilderness.com and let me know what you got out of the webinar, what you would like to see in upcoming webinars and how I might be able to further assist you. Again, I greatly appreciate your desire to join me and I hope that you will also join me for my future webinars. Thank you again for being willing to join me today. I really appreciate your willingness to take the time out of your schedule. This will be the 1st of many free webinars to come on the uses and benefits of essential oils. As most of you know, educating on our successes with autism and aspergers is something that I hold near and dear to my heart. My son and I both receive great pleasure when we are able to help other individuals to overcome the autism and asperger tendencies that can make life hard. We have been very blessed in how our son has overcome SO many of his struggles by means of his diet, supplements and herbs, our lifestyle and the use of essential oils. So please help us reach as many people as we can and share this post with your friends. You can find additional resources here on our page for gluten free recipes, interviews I have done with my son on my radio show and links to our video channels where we have done many varying videos on the subject. There will also be more resources coming ahead where he and I will cover the additional protocols we have used that helped him immensely!